Package Deals Available with brakes, etc. DSE's exclusive billet aluminum offset shackles are designed to relocate the rear leaf springs inboard to accommodate larger rear tires. They were computer modeled and optimized with FEA, tested, and then CNC machined. They relocate the rear leaf spring inboard to accommodate 335 tires ( with a section of 13.5" ) on a Camaro / Firebird or 315 tires ( with a section width of 12.6" ) on a Nova. The shackle offset is 1-3/4". Use along with our other mini-tub components to complete your project. 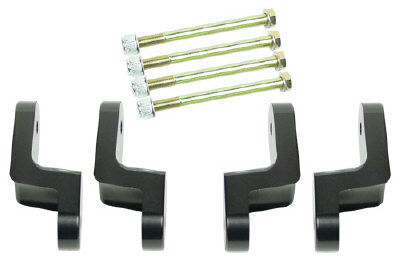 Kit includes 4 offset shackles and Grade 8 fasteners. This is the ORIGINAL billet aluminum offset shackle! The DSE shackle is designed for maximum suspension travel. There are hundreds of our shackles on the road and track with proven performance. Do not accept any imitation! The stock fuel tank will need to be narrowed or MCB offers new narrowed stainless steel fuel tanks when relocating the rear leaf springs (call for price and availability).